Preheat the oven to 325 degrees F. Let’s start with the frosting because it needs to sit for a couple of hours to be at the best consistency. 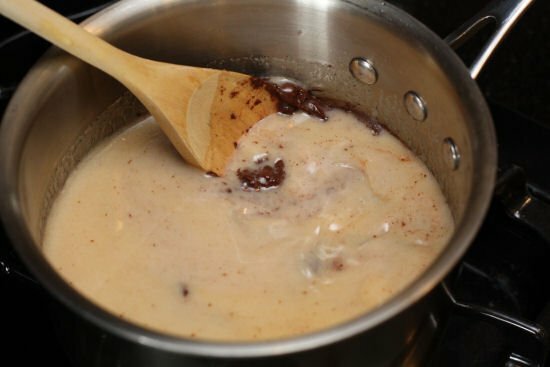 Heat the heavy cream, stick of butter, sugar, and salt in a medium heat saucepan until the butter melts. Once the butter melts pour in the chocolate chips and turn the heat down to low while stirring constantly. After the mixture is relatively smooth add in the 1/4 cup of coffee and vanilla extract. 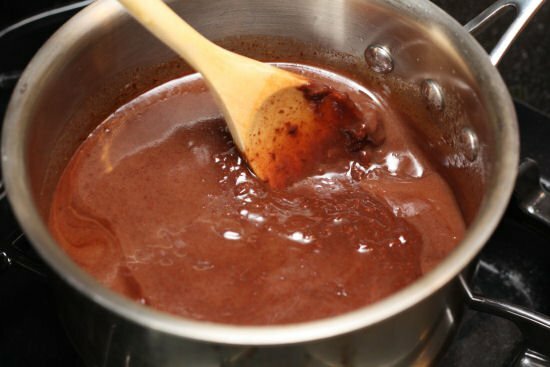 Transfer this mixture to a bowl to cool for about 1-2 hours at room temperature. You can stir this mixture occasionally but try not to over stir it. This frosting will look extremely runny but don’t fret. 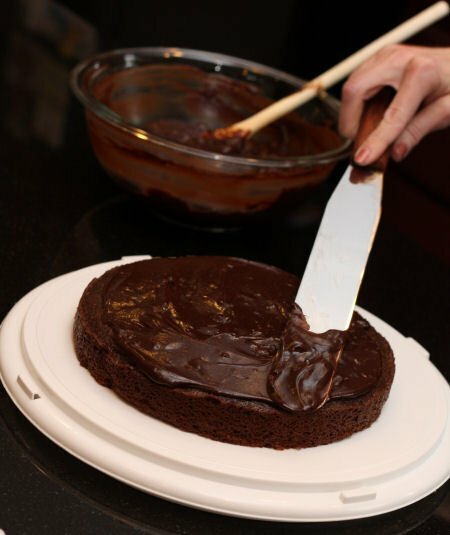 It will solidify to a nice gooey amazing chocolatey frosting that will spread quite easily. Now for the cake. Sift together the sugar, cake flour, salt and baking soda into a bowl. Chop up that chocolate as fine as you can get it and then in a bowl pour the 1 cup of really hot coffee over top of it to melt it. In a separate bowl whisk together the eggs and vegetable oil. Add the sour cream, vanilla extract, and coffee-chocolate mixture. Stir well. 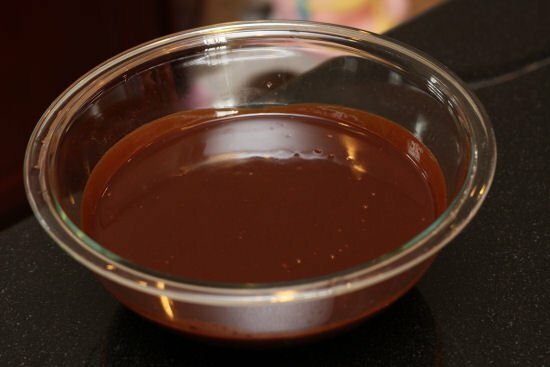 Now stir this chocolatey liquid mixture into the sifted dry ingredients by thirds, stirring really well after each addition. It is important to only add a third of the liquid to the dry, then stir, then another third of the liquid to the dry, then stir, and then again so the mixture is the right consistency. The photo below shows just how wet the mixture should look when finally mixed together. 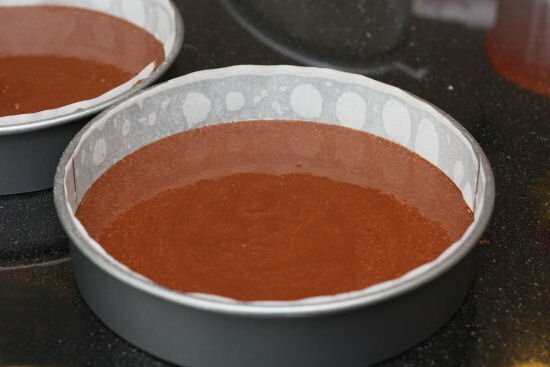 Divide the cake mixture evenly between two cake pans. 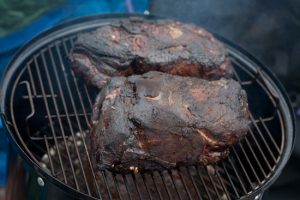 Notice how I’ve lined mine with parchment paper and non-stick spray. After the mixture is in the pans drop the pans onto the counter top from a height of about 3 inches. This helps get any air bubbles out of the cake. Bake for 30-40 minutes until a toothpick can cleanly come out of the center. Oh does that smell great! Now turn the cakes out onto a drying rack until cool (about 1 hour or a little less if you are really excited). Once cooled start spreading the frosting on the top of the first layer, which will be the middle of the cake. Then spread it on the top! Don’t forget to put the frosting on the sides! 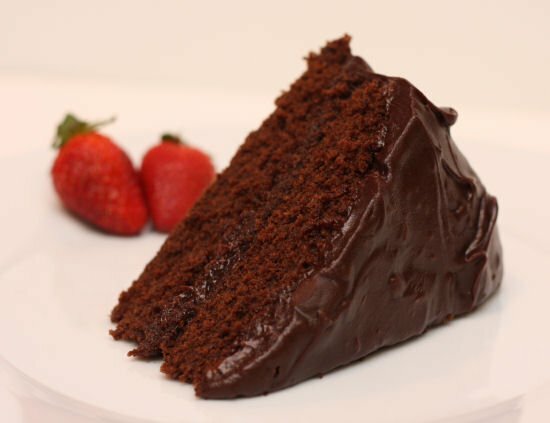 There you have it – an awesome super chocolatey chocolate cake. 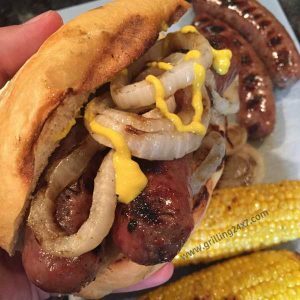 All you need now is a HUGE glass of milk! Oh man!! 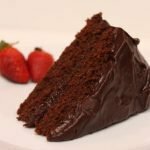 This Super Chocolatey Chocolate Cake Recipe is requested by all of my friends. 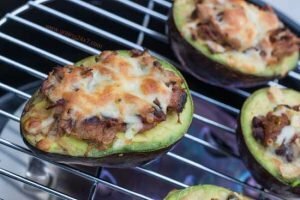 What a solid recipe. Preheat the oven to 325 degrees F. Let’s start with the frosting because it needs to sit for a couple of hours to be at the best consistency. 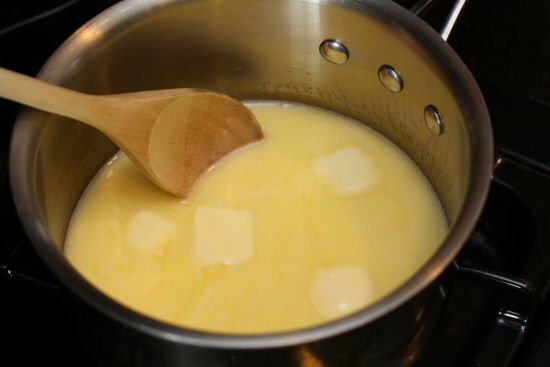 Heat the heavy cream, stick of butter, sugar, and salt in a medium heat saucepan until the butter melts. Once the butter melts pour in the chocolate chips and turn the heat down to low while stirring constantly. After the mixture is relatively smooth add in the 1/4 cup of coffee and vanilla extract. 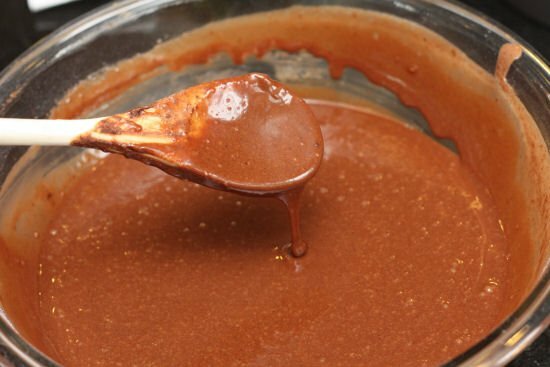 Transfer this mixture to a bowl to cool for about 1-2 hours at room temperature. You can stir this mixture occasionally but try not to over stir it. This frosting will look extremely runny but don’t fret. 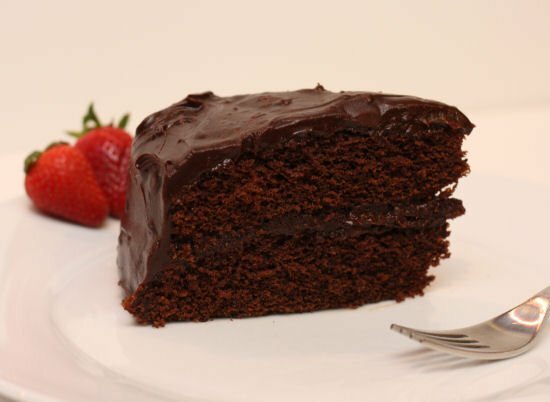 It will solidify to a nice gooey amazing chocolatey frosting that will spread quite easily. Now for the cake. 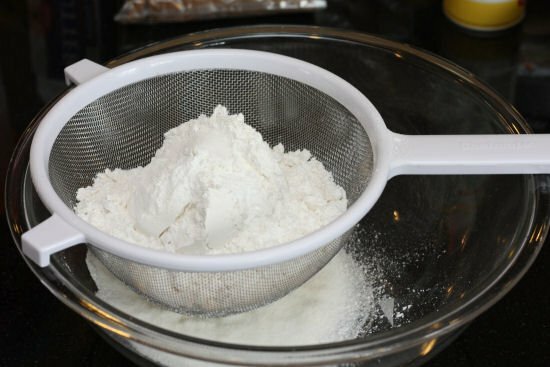 Sift together the sugar, cake flour, salt and baking soda into a bowl. 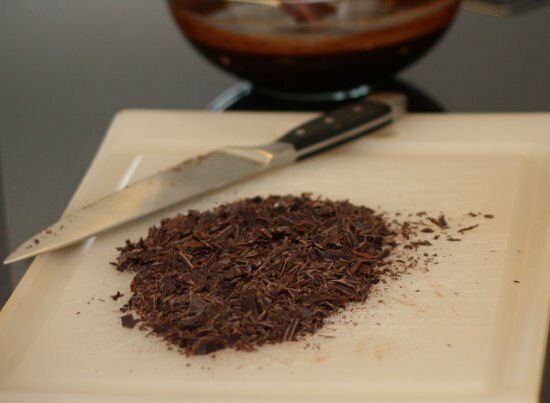 Chop up that chocolate as fine as you can get it and then in a bowl pour the 1 cup of really hot coffee over top of it to melt it. 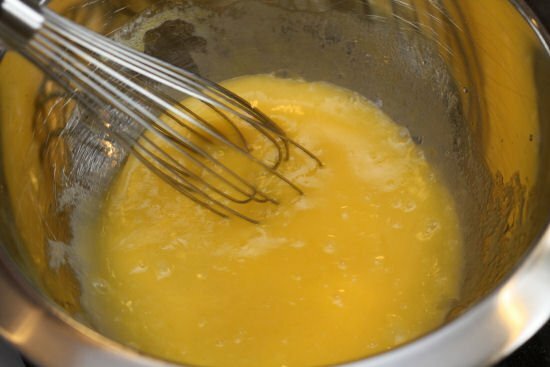 In a separate bowl whisk together the eggs and vegetable oil. Add the sour cream, vanilla extract, and coffee-chocolate mixture. Stir well. 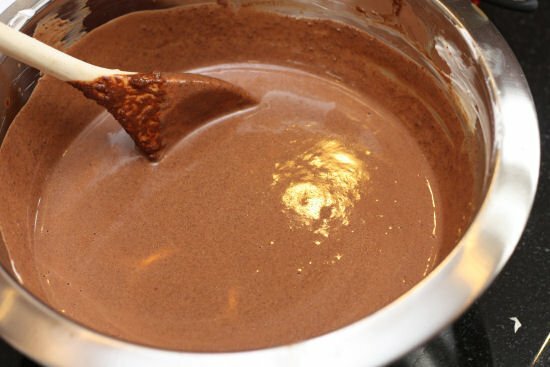 Now stir this chocolatey liquid mixture into the sifted dry ingredients by thirds, stirring really well after each addition. It is important to only add a third of the liquid to the dry, then stir, then another third of the liquid to the dry, then stir, and then again so the mixture is the right consistency. 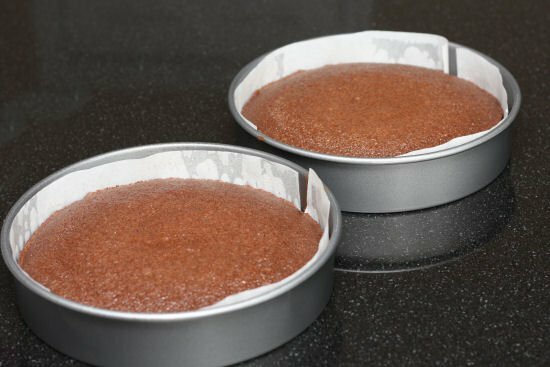 Divide the cake mixture evenly between two cake pans. Notice how I’ve lined mine with parchment paper and non-stick spray. After the mixture is in the pans drop the pans onto the counter top from a height of about 3 inches. This helps get any air bubbles out of the cake. Bake for 30-40 minutes until a toothpick can cleanly come out of the center. Oh does that smell great! Now turn the cakes out onto a drying rack until cool (about 1 hour or a little less if you are really excited). Once cooled start spreading the frosting on the top of the first layer, which will be the middle of the cake. Then spread it on the top! Don’t forget to put the frosting on the sides! 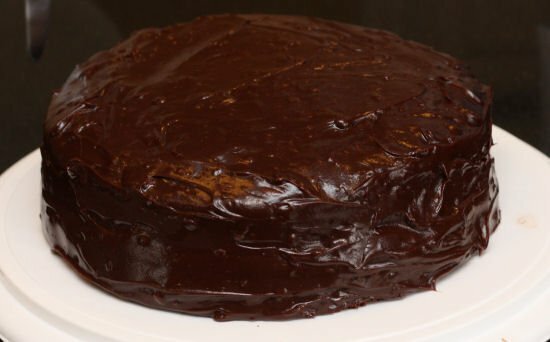 There you have it – an awesome super chocolatey cake. Get your milk ready to drink b/c this is rich!